The best stuff that you didn't see on Facebook. 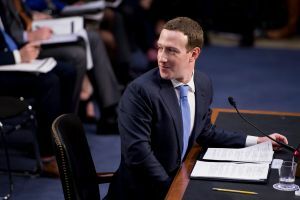 For the past two days, the world has watched Mark Zuckerberg’s evident discomfort as he tolerated a 10-hour marathon of questions from members in both houses of congress. The spectacle had it all — was light grilling, plenty of apologizing and vows to do better, and more than a few explanations of how Facebook actually works. And the internet was loving it. Well, specifically, Twitter, cuz Facebook doesn’t exactly lend itself to this kind of live reaction (sorry Zuck). Here are some of the best reactions we spotted. Zuckerberg blinked awkwardly at the camera. And the internet tweeted. Someone give that man a little blush. Seriously though, Remind you of anyone? What is that deer-in-the-headlights look on his face though? Seriously, never cut your own hair. Especially the day before prom. Despite the five-head, everyone was excited to see the robot masquerading as Mark Zuckerberg him. Mark Zuckerberg in 2016: "Personally I think the idea that fake news on Facebook … influenced the election in any way is a pretty crazy idea"
It took a while for him to speak. Instead, his human suit analyzed a water bottle and tried to pour it into a glass and slurp it like a regular old CEO. As you can imagine, it was quite difficult. "Thank you, Congressman. I have prepared an oral statement before we begin." I mean, the man is very probably a robot. Okay, after all these digs though, he wasn’t looking BAD. Maybe a little taller than usual even. Tech companies pretend they don’t understand the subtlety of the bias their platforms introduce, but OF COURSE they do. He finally speaks! I feel like this should somehow be a drinking game. Take a shot every time Zuck says “content” or a lawmaker mispronounces Cambridge Analytica. Or, maybe something that just doesn’t make any factual sense. But is Facebook too powerful, Mark? That’s the real question here. Does this feel like trying to explain the internet to your parents to anyone else? At the end of the day, at least someone was happy. Day Two: Congress didn’t magically obtain knowledge of the internet. But hey! Biden is here! Still, all eyes were on Zuck. The big news of the day? Zuckerberg’s own data was also sold to third parties. But, don’t worry, that’s shouldn’t put too much of a wrench in his plans.